Bicycling is a great way to enjoy the outdoors and be physically active! Our area offers a wide variety of trails – from flat paved rail trails to steep and rugged single track. Utilizing a bicycle for transportation saves money and is good for personal health and the health of the planet. Check out our maps and resources related to bicycles and get involved in creating a community that supports active transportation. Most often a driving route is not the best biking route to work, school or to do errands. 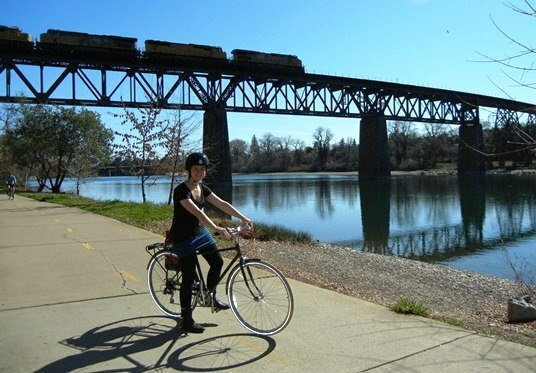 Use this map to find the best way to commute by bike in Redding. The map shows trails, short cuts, and routes indicating shoulders and traffic volume. Maps available at area bike shops or by calling 245-6583. Bike commuting is an effective and inexpensive way to get to work or school. It’s also fun and can reduce stress. Riding a bicycle keeps our air clean, saves money, gas, and wear and tear on your vehicle. Set a goal to ride to work or school a couple days a week. Have questions about how to start commuting by bicycle? Visit www.bikeforums.net to find answers to questions such as: What kind of bike works best for commuting? How should I equip my bike (including lighting)? What should I wear? How should I wash up at work? This group encourages bicycling for recreation and transportation and advocates for a safe and connecting system of bikeways on trails and streets. 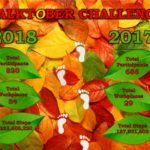 Activities include providing input to local jurisdictions on bicycle related issues, pulling together the voices of various types of bicyclists, and bike month activities such as the Bike Commute Challenge. For more information, to bring an issue to the group’s attention, or to get involved, call 945-2176. The beautiful and diverse backcountry trails of Redding call for your exploration and discovery. On your mountain bike you can cover scenic foothills to river front vistas— from flat paved rail trails to steep and rugged single track. The Mountain Bike Maps offers Beginner, Intermediate, and/or Advanced Mountain Bike Trails options. 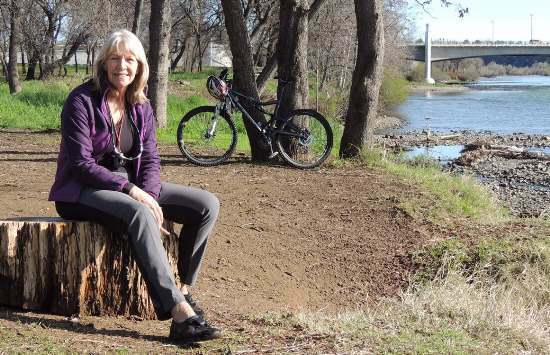 These Mountain Bike Trails are brought to you by the Redding Mayor’s Mountain Bike Challenge. 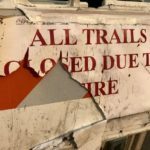 Mount Shasta Bike Park is a great place to bring the entire family. 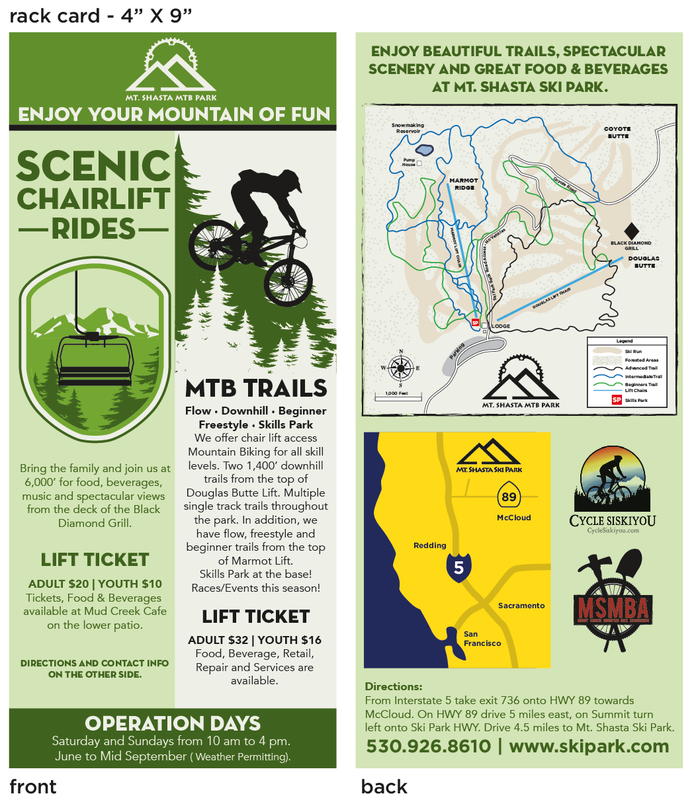 They have chair lift access mountain biking on the Marmot and Douglas Chair lifts. Their trails range from beginner to expert with a nice variety of man-made features with irrigation on most trails. They are open Saturday and Sunday from 10:00am-4:00pm. For more information go to the web at https://www.skipark.com/ or call 530-926-8610 or find them on Facebook and Instagram. National Bike Registry – Register you bicycle with local law enforcement through the National Bike Registry. Bikeability Checklist Tool – A bikeable community is one that is safe, convenient, and pleasant for biking. More people bike for recreation and transportation when a community is bikeable – which helps improve fitness, health, air quality, and creates a greater sense of community. Use the Bikeablility Checklist to determine the bikeability of your community or neighborhood. City of Redding Service Request – Form that allows citizens to make inquiries or request repairs for street, traffic or storm drain related problems. Learn to transport your bike on RABA – With a bike rack on every Fixed Route and Express Route bus, you can make bike riding part of your regular commute. Bicycle Parking – Enjoy the expanded bicycle parking in our community thanks to a partnership between Healthy Shasta, Viva Downtown and local cities. Additional racks will soon be arriving at Shasta College to serve commuting students. The racks were designed by Viva Downtown Redding’s Design Committee and created by Gerlinger Steel and Supply. 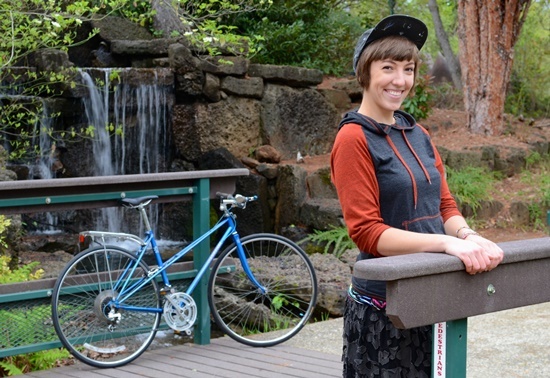 For more information about bicycle parking contact Healthy Shasta at 229-8243. The League of American Bicyclists – Offers information on bicycle education (classes on bicycle safety and sharing the road), advocacy, and legislation. Become a League Certified Cycling Instructor (LCI). The National Center for Biking and Walking (NCBW) – NCBW strives to create bicycle friendly and walkable communities. 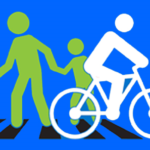 The aim of NCBW is to change the way communities are planned, designed, and managed to ensure that people of all ages and abilities can walk and bike easily, safely and often. Shasta Lemurian Classic – Local mountain bike race for over 20 years. Race the trails in Whiskeytown with three ride options: Short Course (8 miles), Intermediate Course (20 miles) and Long Course (26 miles). Held the last Saturday in April. 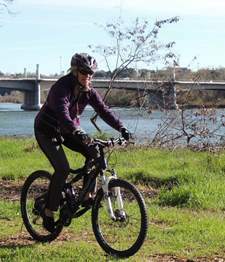 Redding Mountain Biking – Enjoy the outdoors, getting to know new people and having a blast riding with this group that plans weekend trips as well as local rides. Riders of all ages and fitness levels are welcome. 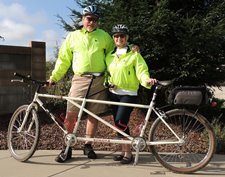 Shasta Wheelmen – Join this family-oriented cycling group for a ride! A variety of scheduled rides are offered every month and riders of all ages are welcome. Other local recreation groups also offer bike rides and events. 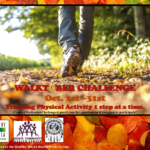 Visit our Recreation Opportunities page for more information. Shasta Living Streets strives to ‘open streets to people and bring car-free space to our area.’ Scheduled events open the street to people to walk, bike, visit, and enjoy. See their website for more information and event dates and locations. Check out the infographic below and learn more about the positive impact bikes can have on health and the environment. 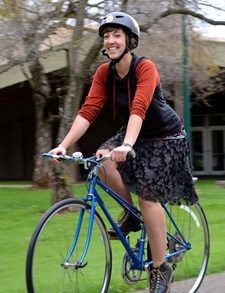 Meet some everyday people who enjoy bicycling as part of an active lifestyle. The bicyclists on our streets are moms, dads, grandparents, someone’s child…motorists and bicyclists alike have a shared responsibility to follow the rules of the road, watch out for each other, and travel respectfully. 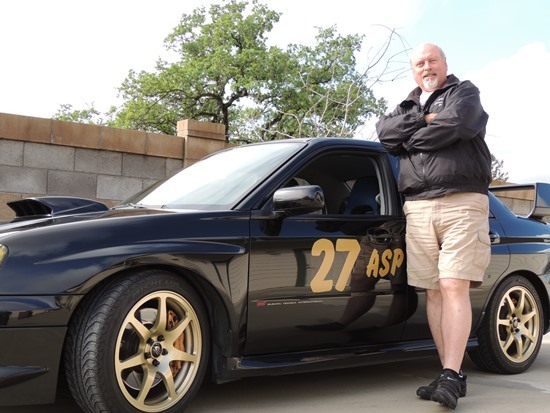 Jon, owner of a driving school in downtown Redding, loves fast cars and racing on the track. He is also an avid outdoorsman and fisherman. Jon and his wife enjoy bicycling as a way to stay fit and prepare for larger outdoor adventures, such as climbing Mt. Shasta and Mt. Whitney. They find that it’s easier to fit quick bicycle rides into their busy schedules than trying to carve out time to make it to the gym. In your car: Give plenty of space when passing bicyclists. When passing on a narrow road, move to the left early on so that motorists behind you have a view of the bicyclist and cars coming towards you know what to expect. Intentionally drive over the reflectors at the center line, the sound will help alert bicyclists that you are approaching. Give the bicyclists at least 3 feet of space when passing. On your bike: Ride predictably and follow the rules of the road. When riding along parked cars, avoid swerving in and out between the cars – you are more predictable and visible to motorists when you ride in a straight line. Avoid riding too close to parked cars to stay out of the door zone (the space in which a car door may swing open). Increase your visibility by mounting a red light on the back of your bicycle, using the flashing red light mode during the day and the solid red light at night. Tamara is a full-time student at Shasta College who enjoys food and photography. She lives an active lifestyle, enjoying dance and using her bicycle for transportation several days a week. In your car: Be focused and alert when driving. Be on the lookout for bicyclists, especially at intersections. Be patient and wait for a safe time to pass. On your bike: Ride on the right side of the road, in the same direction as traffic. Wear bright colors. Take bicycle rides for the joy of it on trails and streets you are comfortable on, then plan to ride to destinations with these routes in mind. Give yourself time to enjoy the ride, it’s more dangerous if you are in a hurry. Special thanks to Matthew Ray for Tamara’s photos. Nancy can often be found volunteering at Red Cross shelters during local fires and across the country when disasters occur. She greatly enjoys spending time with family and friends. She rides a bicycle because of the sense of freedom it provides and she enjoys the challenge of mountain biking on dirt trails. In your car: Don’t drive distracted. Don’t text or talk on the phone while driving. Check your blind spot when turning right, you may not see a bicyclist coming up in your mirror. Keep in mind that bicyclists have the same rights and responsibilities to use the road. On your bike: Make eye contact with drivers, especially at intersections. Always signal before you ‘take a lane’ and keep in mind that cars are bigger – they will always win in a crash. bicycle to class on campus. She choses to take RABA and ride her bicycle instead of getting a driver’s license. 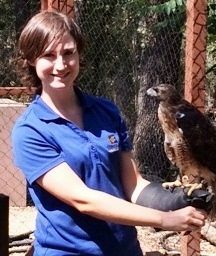 She is a busy volunteer at Turtle Bay Exploration Park, where she enjoys taking care of and spending time with the animals. In your car: Don’t underestimate the speed that bicyclists are traveling – be careful to not turn directly in front of bicyclists. On your bike: Know and use the simple hand signals for right, left and stopping. Everyone can get where they are going safely and more quickly when all road users respect each other and use common sense. Follow the law: obey signals and stop signs, ride in the same direction as traffic, follow the rules of the road. Be predictable: ride a straight line (don’t weave), signal, check behind you when changing lanes. Be conspicuous: ride where you are visible and wear bright clothing, use lights and reflectors, make eye contact. Think ahead: watch for turning vehicles, ride outside the door zone of parked cars, watch for road hazards such as potholes. Ride ready: wear a helmet, check you tires and brakes, carry tools or supplies. Be alert in intersections, especially when turning. Use your turning signals and don’t underestimate the speed a bicyclist may be traveling. Give bicyclists 3 feet of clearance when passing – it’s law in California beginning September 2014. Remember that bicycles have the same rights and responsibilities at motorists (yes, expect to see them riding on the road). Appreciate that each bicyclist on the road is replacing a vehicle that could otherwise be adding to the traffic. Bicyclists are fellow human beings with family, friends and talents. Look around – but not at your phone. 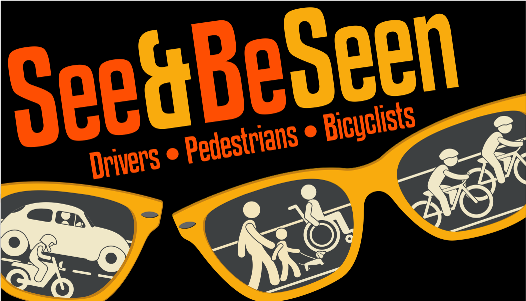 You are more likely to see bicyclists, vehicles and pedestrians when you are watching for them. When parallel parking, look before you exit your car to avoid pushing your door into a passing bicyclist. with tips for drivers, walkers and bicyclists. about sharing the road and a diagram for motorists on how to make a right hand turn when there is a bicyclist. Rules of the Road at California DMV. Special thanks to City of Redding and RABA for providing support for this campaign.